Just over 10 days after Super Typhoon Haiyan struck the Philippines, damage reports continue to come in and the death toll, unfortunately, continues to rise. It is now estimated by the local government that nearly 3,500 people have perished as a result of this storm. The United Nations puts this total higher, at 4,460. Either way, this would make Haiyan the second deadliest tropical cyclone in the nation’s history, behind Tropical Storm Thelma of 1991. Damage is now estimated at around $14 billion, which is over 5% of the Philippines’ GDP. Relief efforts from across the globe have been in place over the past week…as thousands of donations continue to pour in. Even so, many fear the recovery efforts will be long and arduous, taking several years to be completed. 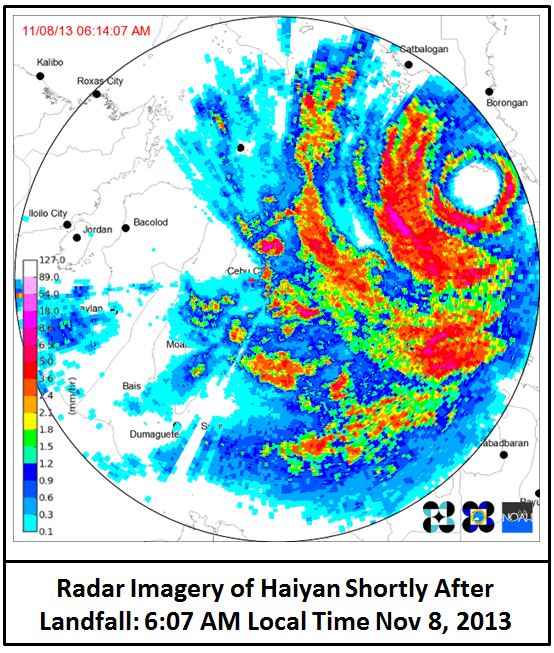 Haiyan made its first landfall at 4:40 AM local time on November 7, 2013 near Guiuan, on the Philippine island of Samar. After that, the super typhoon made a second landfall nearly an hour later about 17 miles south of Tacloban City, which is the capital of the Philippine province of Leyte. The city itself is highly populated, with over 200,000 residents. As a result, the greatest death toll occurred in this vicinity. Most of this was due to storm surge, which was measured at over 17 feet during the peak of the event. 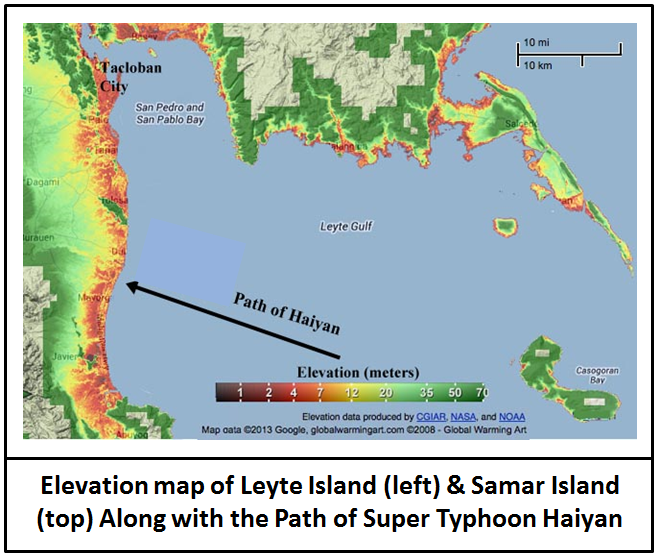 This particular area of the Philippine Islands is especially susceptible to storm surge, as the geography of the region (see below) aids in funneling water into the Leyte Gulf and eventually San Pedro Bay. Although there are no official ground observations that captured the storm’s strongest winds and lowest central pressure, estimates have been made via satellite as well as other empirical observations. That being said, Haiyan is now being credited as the strongest tropical cyclone at landfall…with estimated sustained winds of 195 mph and gusts up to 235 mph. The previous record was held by the Atlantic’s Hurricane Camille in 1969, which made landfall in Mississippi with winds of 190 mph. 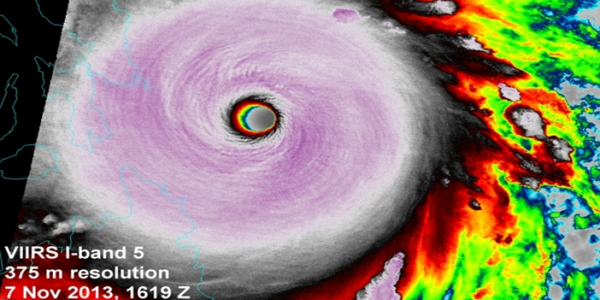 Additionally, a central pressure of Haiyan during its second landfall was calculated to be 888 millibars, putting it within the top-five strongest cyclones of all time when based on central pressure alone. After passing through the Philippines, Haiyan made a third and final landfall near the Vietnam / China Border several days later. Fortunately, a combination of high wind shear, drier air aloft, and cooler ocean temperatures were able to weaken the system to a minor typhoon, with winds of 75 mph at the time of landfall. Still, damage was significant across the countryside. A combination of high winds and nearly 15 inches of rain across parts of the region resulted in $700 million in damage and at least 20 additional deaths. Although Super Typhoon Haiyan has since dissipated, its legacy will live on for some time to come. The devastation caused by this powerful storm proves that even in our technologically advanced society, severe weather threats can and still do occur. In similar fashion to Sandy, although the forecasts for this storm were quite accurate from a meteorological perspective, there is still much do be desired in terms of public dissemination of information. As a result, this will undoubtedly be the main focus of most weather agencies across the globe as we head into the coming decades.